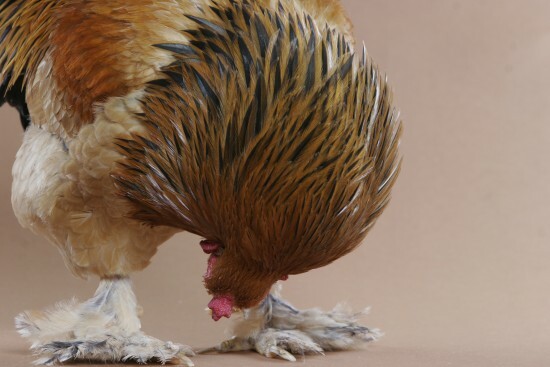 Feather foot chickens: there’s just something about the magnificent feathered legs of breeds like cochins or silkies. 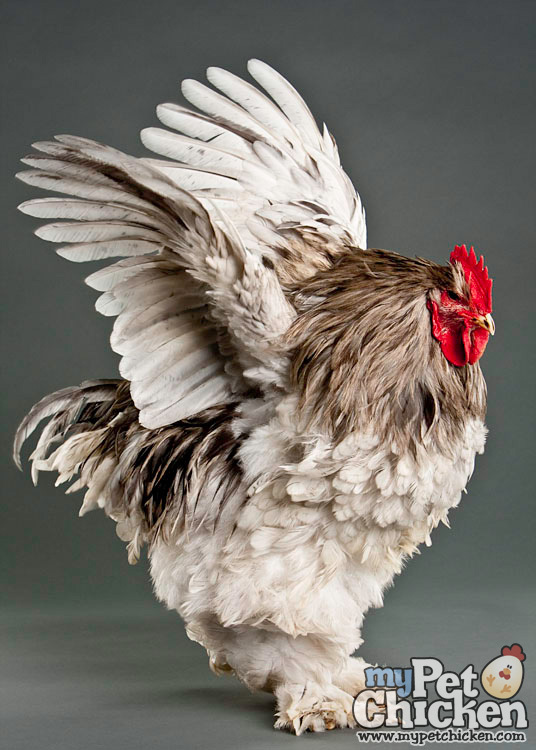 Fancy feathered chickens in general—including those with crests, beards, tufts and/or muffs—can be fun to keep as pets, simply because they’re so showy and spectacular. Many people have never seen feather footed chickens before. Sometimes even the chickens themselves seem surprised. What in THE WORLD do I have on my feets? But before you consider keeping feather foot chickens, there are a few issues to consider. Just as you’d want to know about any special issues with a prospective pet dog or cat breed (Long hair that needs frequent grooming? Pushed-in snout? Heavy shedder? Hard to house train? ), you want to be aware of the issues associated with feather foot chickens before you acquire any, so you can be prepared. Chickens with feathered legs are generally more vulnerable to scaly leg mites than chickens without the feather foot quality. The feathers emerge from beneath the leg scutes (scales), and make it easy for the mites to infest! While scaly leg mites are usually fairly easy to treat for at home, the feathered legs can make it more difficult, and significantly messier, to do so. Fancy feathering in general can be a problem when it comes to picking. Picking basically means your bird can get picked on–actually, that’s literally what it means when it comes to chickens. If you keep 5 “regular” chickens—that is, having no fancy feathering—and one poor soul with a crest or feathered legs, for example, the other birds may try to pluck out her “weird” feathering. Picking is not usually caused by keeping birds with fancy feathering, but fancy feathering can exacerbate the problem sometimes. 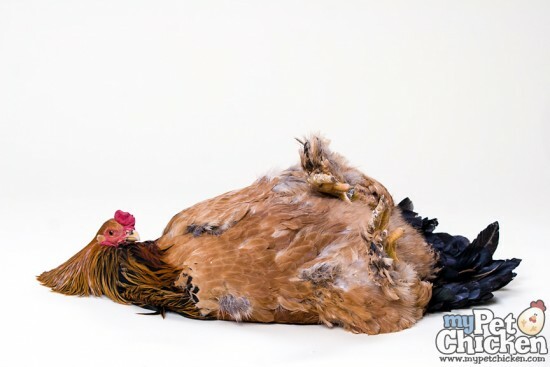 Particularly in the case of hens and even roosters who are also submissive, having the feather foot characteristic can lead to bloody legs and serious problems. There are ways you can deal with picking issues… but picking can get to be a habit, so it’s best to avoid having it happen in the first place. Take common sense precautions like providing plenty of space and entertainment, lots of room on roosts and at feeders, and make sure you don’t just have one poor fancy-feathered bird as the odd hen out. Those leg feathers look beautiful in breed pictures and illustrations. However, in the real world they don’t usually remain so perfectly coifed (or would that be plumed?). Unless you live in a dry or desert area, make sure you site your coop and run so that it doesn’t get muddy. It’s not just a matter of being unsightly on their feathers, and not just a matter of (ick) possibly having their legs covered with muddy droppings. If your hens have muddy, poopy leg feathers, they will carry that mud into the nests, and your eggs will be a mess, too. Do you want to wash them all? (Usually, the answer is no–and not just because it’s a lot of extra work, but because washing them can lead to problems!) If you want your hens to hatch the eggs, having them covered with dirty poopiness can make them vulnerable to bacterial infection. I prefer to hatch clean eggs! You’d think the feathered legs would provide more warmth in a cold season, rather than be a cause for concern! Especially with bantam feathered leg breeds—since bantams can have more difficulty with cold—you’d think that leg feathers would help. And that’s partly true. They do offer some extra protective insulation. However the problem again is with wet weather. If your chickens have a wet or snowy run and get slush or mud embedded in their legs feathers, that can freeze hard and cause frostbite issues. These issues are certainly not deal-breakers when it comes to feather foot chickens. It just requires a little extra vigilance to make sure leg mites don’t become a problem, and an effort to provide your flock with a dry area—one that’s large enough to avoid stressing the flock with overcrowding that could lead to picking. 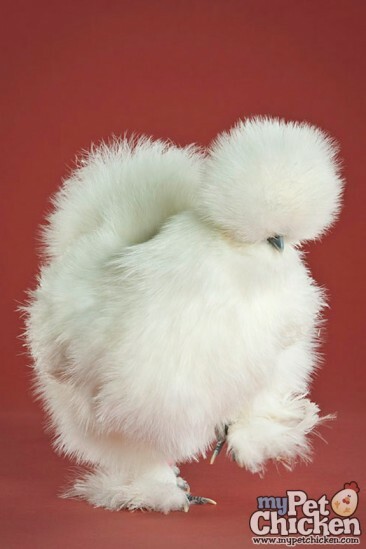 What are your favorite feather foot chicken breeds? I have a buff Brahma and she is neat but my favorite was a teeny little porcelain d’uccle whose feather feet were almost as big as she was. She used to like to fly up and perch on my shoulder. For the leg mites when you treat them with petroleum jelly, how do you keep them from trying to preen it off, or getting it on their beaks so they don’t get it in their feathers or eat it? They shouldn’t be able to eat it; it only needs to be a very thin layer, such as you’d have on your lips, for example. But keeping it thin is why it’s so much more difficult to treat feather-legged breeds. It’s hard to get a thin layer (rather than a gloppy layer) with the protruding feathers—and hard, too, to get the jelly all over the legs when you have to work around the feathers. In such cases, you may want to consult a vet to get a prescription treatment, or to have the vet professionally apply it. It’s mostly around the toes because of broken feathers the scales are pushed up some and around the base where the toes meet. Only reason I think it’s scale mites is because it’s on some other chickens without feathers. So it shouldn’t be too hard to keep it off the feathers I just didn’t want them to try to somehow try to preen the scales on their feet. :). Thank you so much! All the pictures on this post are so cute! Great article Lissa. Off the top of my head: Dorkings, Faverolles, Silkies, Houdans and Sultans. I have a mixed flock.of 7 hens. All will be 5 years old soon. I had 2 dUccles. They passed in the summer. If left me with one feather footed maran.afte her recent moly, as foot feathers were growing in, they keep getting pulled out and bleeding. I have been putting rooster peck no more every few days. Is there anything I can do? If you can keep the feathers from getting pulled until they’re in, they may seem like less of a target. But this is a tough one. I had one RIR hen some years ago that I finally had to rehome with a clean-legged flock, because she just went after foot feathers. No other RIR or hen I’ve had was so single minded. In some cases, you may have to keep the feather-plucker separate from feather-footed breeds. howdy, I would like to know at what age Cochin fowls start growing feathers on their legs and feet as mine are four months now and look like Australorp, for instance. Chickens with feathered legs have down on their legs when they hatch, and grow feathers to replace the down as soon as they grow feathers on their bodies. Unless they are pecking each other’s leg down/feathers away—that is a bad behavior that happens with chickens, but you would likely notice the aggression and occasional wounds—it sounds like you probably don’t have feather-legged birds. You might contact the place you got your birds and see if they’ll refund or replace. Mistakes do happen, and most hatcheries are happy to help. Australorps are great birds, but if you wanted cochins, you should have gotten cochins. I recently purchased a Partridge Cochin hen – 6 weeks old. She is the standard color partridge, however she has no feathers on her toes and not the usual “pantaloons “. She has a long black tuft resembling that on the head of a naked neck. Is she possibly NOT a Cochin? Yes, it sounds like she’s not a cochin. Cochins do have feathered legs. If you send a good photo and a description to info@mypetchicken.com, some of our experts might be able to help you identify the breed.